Traditionally, the vast world of flowering plants, phylum Anthophyta, has been known as the angiosperms. It has been divided into two great subdivisions, or classes, known as the monocots and the dicots. Recent studies indicate that the situation is more complex than that. However, for our backyard, amateur studies, it still makes some sense to think in terms of monocots and dicots. You can find more information about the new concepts here. Despite the new concepts, when you look at a plant with the idea of identifying it, it's still helpful to resolve this question first: "Is this a monocot or a dicot?" MONOCOTS, such as the False Garlic (Nothoscordum bivalve) at the right, produce flowers in which corolla lobes, sepals and other flower parts all typically number 3, or a multiple of 3. False Garlic's blossom has six petal-like segments and six stamens. The veins in monocot leaves are usually but not always aligned parallel with one another, as in blades of grass. Cut across a monocot's stem and the water-bearing tubes, or vascular bundles, inside are scattered throughout the pith, not arranged in concentric rings like the rings of a tree. When a monocot's seed sprouts, the first leaf up is a single spike looking like a simple blade of grass arising from the soil. In fact, the Grass Family is the most common monocot family in our backyards, but there are other important monocot families, including the Lily (False Garlic's family) Orchid, Amaryllis, Iris, Canna, Banana, Sedge, Rush, and Palm Families. About 65,000 monocot species are known worldwide. DICOTS have flowers in which the sepals, petals or corolla lobes, and other parts, usually number 4, 5, or multiples of 4 or 5. 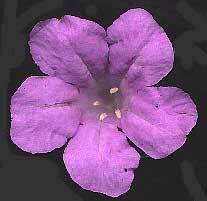 The Ruellia (Ruellia caroliniensis), at the right, clearly shows a typical dicot's floral structure -- 5 petals and 4 anthers visible. 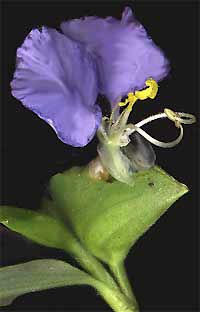 Similarly, most Bean Family flowers possess 5 sepals, 5 petals, and 10 stamens. Veins in dicot leaves usually branch and then join back together, forming netlike patterns of the kind seen in most tree leaves. Cut across a dicot's stem, and the vascular bundles inside are arranged in concentric rings. The vast majority of trees are dicots, and tree rings are such concentric rings. When a dicot's seed sprouts, the seedling raises two leaves, or cotyledons, above the ground, with the future stem arising between them. This is very unlike the monocot's single cotyledon. About 170,000 dicot species are known worldwide. Nearly all our deciduous trees and common flowering bushes and vines are dicots, but nearly all grasses and grasslike things are monocots. Now let's have a test. Is the Day Flower (Commelina communis) shown at the right a monocot or a dicot? This is sort of tricky, but nature is full of tricky blossoms. The leaves appear to have parallel veins, so there's a vote for "monocot." 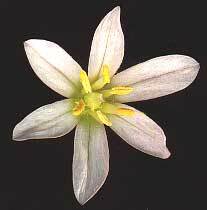 However, this flower seems to have only two petals, and that doesn't fit either monocot or dicot. If you could examine the stamens you'd see that there are three with anthers and three that are "sterile," or without anthers, so there's another vote for "monocot." Well, fact is, it is a monocot. The main proof is that actually there is a third petal, a much reduced, translucent one at the flower's bottom, so there are also three petals. Therefore: Monocot.